There are gifts that your friends received that you might throw a full-blown shrieking tantrum over because you didn't get one, others that you might covet just a little and try to wheedle a loan of. And there is the sort of gift that you just thank your lucky stars no one considered for you. Then there is this sort, the gift that you know will make the recipient re-examine their life, their relationships, their wardrobe, and think gloomy introspective thoughts about how the world really sees them. These uncomfortable-looking banana custard-coloured Frida Kahlo socks were given to Suzy. On the up side, her friends look forward to the joyous occasion on which she wears them. Hopefully with sandals. these two, Hilda and daughter Millie, loafing about at the Anglo-Saxon demonstration farm in the wonderful Bede's World, Jarrow. I know this is probably old hat to you, and that I'm unfashionably late in discovering it, but out there in the real, i.e. book-buying, world there is a book on blogging called Nobody Cares What You Had for Lunch (see mightygirl.net) that aims to aid the hapless blogger who can find nothing much to write about to inject some vim and vigour into their posts, thus moving away from the dreary and dull minutiae of everyday life. It sounds like a fun book, and probably a wonderful asset if you are seeking added blog-vim and vigour, or if the best post-able thing that has happened to you this week is that salt sandwich you had for lunch yesterday. But without having read the book, I can already take exception to its title. It's just not true that nobody cares! I care what you had for lunch! I like to see the photos! I particularly like the descriptions and photos of those less-than-successful lunches, the soups that look like thinned lumpy cement, the sandwiches that look like roadkill, or the ones where you inadvertently show how truly filthy your stove is. These are the heartening, comforting posts, the ones where you can see that real people often eat peculiar-looking messes and weird combinations - though my friend Annie's one-time favourite remains especially memorable for its prizewinning hideousness: mashed avocado on pumpernickel. Not pretty; shame it pre-dates blogging. It featured regularly in the decrepit ramshackle office we shared with a jolly team many years ago; so decrepit was it that we came in one morning and it took a while for us to notice that two large windows, in their frames, had been stolen in the night. I could badger friends for a week to tell me/allow me to take photos of whatever they are having for lunch, and create a theme: One (Idiot) Person Cares What You Had For Lunch. I suspect, however, that they would start to show off and have rocket or coriander with everything, including the lumpy cement soup. Note: Charlotte maintains that everything you eat these days has rocket in it, which she hates. I disagree, as I know that everything has coriander (cilantro to you American folks, but still nasty and soapy) in it. Me, I'd rather eat lumpy cement. I'm off to have strawberries and cream for lunch now; I have a fridge to clear out, and the other leftovers look less appetising. There will be a semi-liquid cucumber in there somewhere, I'm willing to bet. I like this idea, pinched from other people's blogs, of taking pictures of favourite areas of my home. The reflection visible in one of the pictures is of the little landing window, which in itself was one of the reasons I loved this house at first sight. Today's miscellany: yesterday, I read somewhere that most people who read blogs are lurkers, i.e. people who don't come out of the shadows and post comments, with the result that most bloggers (well, those who haven't fathomed how to work the reader-counting device) don't have a clue who, if anybody, reads their precious prose. I confess that I mostly do that too - lurk, that is - usually because I couldn't post a non-banal comment to save my life, and also because I am so cowed by the wit and/or skills demonstrated in these blogs that I feel Unworthy in the extreme. All these young talented folk who can knit, sew, bake, bring up children, dogs, cats and quails, dress interestingly, have gorgeous partners, write amusingly about them and take decent photos of them at the same time! Why can't I do that? And don't say age. Some of the talented young folk are actually quite mature in years, and downright ancient in dog years. Anyway....I am also very dim sometimes. While waiting the other night for friend Benedict to travel up from the rural idyll* in which he lives, I made us a chicken and vegetable casserole, with mashed potato, and a pudding made up of leftover dark chocolate cake (the one with the over-sweet ganache, though I found I was the only one who complained about that) and fresh raspberries and double cream. And waited. His arrival time came and went, and when he was an hour and a half late, I rang his mobile, thinking he might be doing that thing that our British railway companies like us to do, that is, sit patiently on a train marooned in the middle of a field, for interminable periods, without explanation, usually when most of the other passengers are drunk and rowdy and very loud. I'm getting a bit sick of chicken casserole now, so have shredded the chicken, added more stock, and have chunky chicken soup instead. Tastes nicer than it looks. The weather improved today, and my excuse of it being too cold to go down to the allotment wouldn't hold any longer. 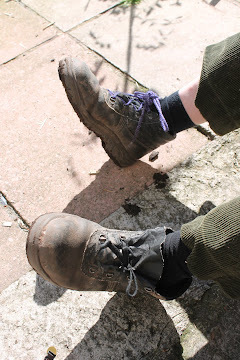 And my word, how the allotment has punished me for my laziness! Head-high weeds, many millions of them now dandelion clocks - and you know how fertile they are! - a rhubarb patch the size of a camper van, and nettles that stung me viciously before I'd even touched them. Eddie the Poisoner muttered a lot about systemic weedkiller being the only way out, and had I thought of giving up half of the plot? But no, shrieked the Greedy Person inside of me, one half of the plot has the greenhouse, and the other half has the shed and I Want Them Both!! Eddie flinched, and backed away into his tidy weed-free plot, where he sits for hours reading the paper and watching his veg grow for him. Later we had a bracing conversation about how this country is going to the dogs. And I staved off the mild warning that I thought might be coming my way (Elizabeth the secretary is a big softie and takes forever to throw anyone off their neglected plot) by taking the rent money down with me and apologising/promising/smiling a lot. Then while the dog got lost in the long grass I spent an age weeding a very tiny square patch with a trowel, while the birds darted about me, the rhubarb loomed menacingly, and the dandelion clocks scattered their little fluffy parasols all over the newly-cleared patch. When I began to faint from lack of lunch, I gave up, pulled an armful of the reddest rhubarb, and traipsed off home for chunky chicken soup. The pudding got eaten ages ago. Strange but True Fact: Harry has not pulled out a single tuft of fur since I received and plugged in the Feliway diffuser on Saturday morning. Clearly synthetic facial pheremones were just what his otherwise sybaritic life lacked. Suzy's plumptious cat, with the most beautiful eyes - or, as in this instance, eye. A cat update, for those of you who care. Kevin the Ancient is rather chipper at the minute, and obviously doing well on his medication. That's a relief; it costs a fortune. After 18 years of resolutely ignoring a litter tray in favour of the back yard, where he has his own large plant pot in the corner, he has started to use Harry's tray, although the etiquette of sharing a loo is lost on him, and I have to do the covering-up for him. I know, I know, you didn't need the detail.....I am getting a second tray, but I know Kevin will use both, regardless. Poor Harry has been to the vet again today, albeit under protest (ie having to be forcibly stuffed into the basket, followed by very loud yowling in the car) and has had a back tooth out. The anaesthetic is taking a while to wear off. Like a tired toddler, he is fighting sleep, and following me around in the most pitiful way, not knowing quite what to do with himself, lapsing into a mini-stupor now and again, and I feel like a criminal. In my guilt and anxiety, waiting for the time when I could rescue him and fetch him home again where I could apologise and atone, I busied myself round the house, it being too cold to go far with the dog. I cleaned windows (yes I did! ), baked a chocolate cake in order to try a ganache topping (very chocolate-y but horridly sweet, I thought) and made an experimental batch of digestive biscuits, which were - though I says it what shouldn't - rather decent, and would be very good with cheese. Tomorrow my friend Benedict is visiting, and he can have them after supper. As he seems to subsist on rather spartan-sounding one-pot meals, two courses and some home baking might seem rather exotic. At the end of my street today. It doesn't look perishing cold in the biting wind, but oh, it was, it was! May blossom. You can officially cast a clout now, but I wouldn't advise it, not in this wind. Daisies. Common as owt, but pretty neverthess. and something else, also lovely, whose proper name I can't remember, although the flower stand lady calls them chinchins. I think I should have a white and green theme this week, as there's a lot of it about. Loveliness in front of the house, at dusk. For once, no snails or greenfly visible, but they are there, biding their time. I don't usually like having murderous thoughts. This is either because of my natural, if under-acknowledged, tendency towards saintliness, or a superstitious fearfulness (bad karma, what goes around comes around, and so on), but murderous thoughts come, against my saintly will, on a regular basis, provoked entirely by the amount of spam I receive these days. Why? It's sooooooo annoying! And it's sent by people smart enough to get through spam filters made of diamond covered with reinforced concrete, but can't manage to spell Million Dollar Business Opportunity Just For You, My Dear Friend. I know they only need one poor sucker to respond and send them a shedload of life savings, but, come to think of it, who are those benighted people anyway, and why aren't their relatives looking after them better? But today, nano-seconds before the well-worn delete button wove its magic, the fake name of the sender caught my eye, and made me smile, admittedly in a rather spiteful and unattractive way. Thank you, Mr Doodoo Abed, I defy anyone not to look at your name without sniggering. But, My Dear Friend, I bet they won't be sending you their under-mattress sockful of life savings. Pre-diet Harry, newly arrived to live with me 2 years ago, and entirely unsuspecting as to the harsh dietary regime about to be imposed on him. Makes your eyes fill up, doesn't it. 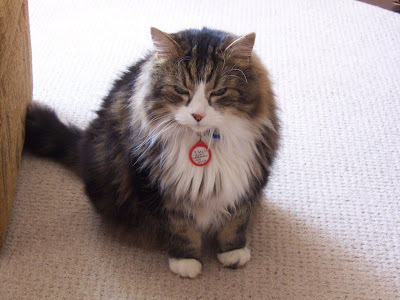 Rachel says: If your cat is a big podge, a veritable pudding-bomb, this is the diet for him. It takes nerves of steel and a will of iron to maintain it, especially if the pudding-bomb hassles you in the most pitiful and heart-rending way, crying, nudging, sitting imploringly by his dish, rolling his eyes at you. Be prepared to feel like a murderess. After that, the diet is simple: repeat many times the mantra that this cat will not die if he has normal portions of food suited to his age. 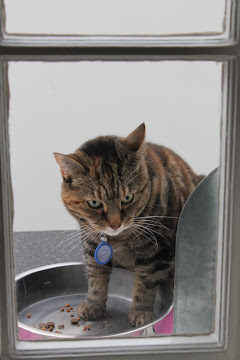 Then make sure that's all he gets, with an occasional treat of something lean and healthy from your own plate - this is essential to prevent your cat from rehoming himself with Mrs Softie down the road, where he will expand and explode within three weeks. Ignore soppy friends who are taken in by the pudding-bomb's superb acting and who say accusingly, "He's getting so thin!" or "Poor boy, he's starving!" when for the first time they can almost feel his spine. Feel proud when the pudding-bomb trots nimbly up and down stairs to burgle your socks, instead of plodding and puffing. Get him weighed at the vet's, so that you know there's someone on your side. 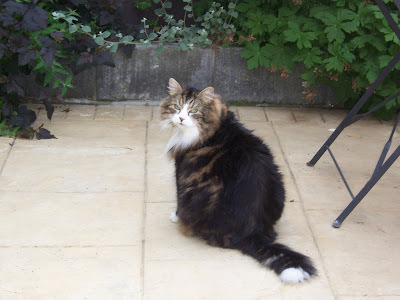 The pudding-bomb weighed about 9 kg or more when he came to live with me two years ago, and progress towards halving his weight has been slow but steady, despite his determined resistance. Harry says: First of all, you need a cruel owner, someone who can harden her heart and ignore your desperate pleas. Someone who can buy cat food for seniors, that really dull, reduced-everything cat food made from old carpet, in very small pouches, open it with little (lying) murmurs of appreciation - "mmmm, smells just like home-braised chicken" - and pretend that by giving you additional portions throughout the day, you are getting proper big dinners. And who won't share her own dinner with you, except in microscopic morsels. Add to that the visit to the vet where said cruel owner is rewarded for this callous regime by finding that while you were a handsome and curvaceous 7.9 kg last time you were weighed, you have dwindled miserably to a mere 6.1 kg. Worse, instead of being taken into care by the vet for your own protection from cruel owner, hear her being congratulated and advised to keep going to the near-death goal weight of 5.5 kg. Plot a move to live with Suzy, who, according to cruel owner, is a big softie, but who I know to be kind, generous, and who understands my needs. The only obstacle to this clever plan is that big fat ferocious Hattie lives with Suzy, and might have to be fought first. In my current state of emaciation, a fight for supremacy is hardly realistic. Oh, how I suffer. There's nothing like a little burst of ill temper to get you going on the housework, I find. And there's nothing like a call to the DWP (Dept. of Work and Pensions) to ask why they have sent yet another 4-page form asking for information supplied a zillion times already, to oblige you with a little burst of ill temper. So, the form has been completed - the ill temper meant it was scrawled in untidy joined-up writing for the DWP to decipher, perhaps by comparing the form to the many previous ones containing identical information - rather than in careful block capitals, and the heaps of papers have been sorted, in a flurry of crossly-muttering activity. Then the dog and I went out again, and the horrid little beast ran away from me, ignoring my calls and charging unbidden across roads where the traffic is intermittent but fast enough to squash a daft little dog who is being deliberately deaf. Now she is creeping about in a cowed fashion as though kicked and beaten rather than merely told off, following me abjectly through the house, clearly wanting to be forgiven. Not yet, would-be-suicidal terrier, not yet. Reply to emails, trying not to write "Put the kettle on - I'm booking a ticket to Sydney right now! (but not with British Airways)." Look at the heaps and consider putting them in a carrier bag to tackle another day. This is a proven technique for high-speed tidying when short-notice visitors are on their way; who says I can't use it today? The other day, Lesley and I were eating very delicious fresh fruit salad, largely made up of tropical fruits, and trying not to think about the air miles and carbon footprint this guilty pleasure brought with it. Have you noticed that food guilt has taken over from the time-honoured Jewish or Catholic guilt we were so comfortable with? Combine it with food scares and terrifying health awareness campaigns, and you could, if you stretched the imagination enough, easily starve to death through sheer fear, shame and confusion. Or, if you were drinking the requisite ten gallons of water a day, through not having any room left for something more solid. Anyway, the fruit salad: as we admiringly singled out the jewel-like pomegranate seeds, we had a small moment of reminiscence, the way ladies of a certain age like to do (though in Britain, 'a certain age' seems to encompass 14 to 104, particularly if you reminisce about food, sweets and toys). Pomegranates weren't that exotic even in the '50s, but had to be approached in a singularly peculiar way. In my family, we believed that the membrane between the sections of seeds was poisonous, which imbued the fruit with a certain thrilling danger but didn't deter us in the least. 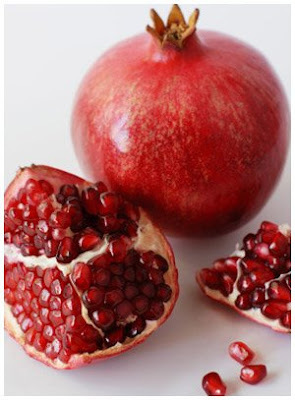 In Lesley's family, as in many others, pomegranate seeds were picked out using a pin. Now, I ask you! Who thought of that one? A harrassed parent, most likely, looking for a bit of peace and quiet. Next time you have a pomegranate to hand, find a pin, and give it a go. We made our own amusement then, and that, children, is why television was invented. So, I shall stick with it, just for them, and because I am a bit addicted to writing something that no one red-pens or contradicts much. What do Canada and Glasgow, sorry, my sister in Glasgow, have in common? A fondness for tartan. (Vancouver has its own Tartan Army, did you know that?) I may consider changing the picture at the top in tribute to my small but select readership - Oor Wullie in a kilt, sitting on that bench in my sunny back yard, eating something deep fried, with maple syrup. * that's a fib; I do care. But not a lot. Ah, the joys of whining and complaining! And then the dog and I had a delightful walk in the Dene, admired the fully flowering cherry trees - well, I did; the dog harrassed innocent park-bench-sitters for a bit of their ice cream - and came home for our dinner. A very satisfying day all round, we think. The dog and Harry looking purposeful in the back lane; the dog has had her hair cut just in time for the warm weather. Harry does what he can to rid himself of his heavy fur coat, and I collect what he removes. Potatoes and rhubarb, with side order of weeds. Eddie's captive New Zealand flatworm - see below. Nesting birds have stripped the allotment fence bare of all the tufts of cat fur that I placed there two days ago, but have turned up their noses (or beaks) at the fluff from the tumble dryer filter. Come on, Harry, time for a wash and brush up; we must keep the cat-cashmere factory running. Giant rabbits have taken over the plots, and as there have been no new fox pawprints recently, and reports of dead foxes on the main road, giant rabbits appear to have the upper paw for now. The old codgers talk fiercely of control by savage and violent means, but it's all hot air, I suspect. A suggested alternative is to repel the cute but voracious invaders with good old-fashioned fish, blood and bone. Your humane suggestions welcomed. Having made the first pond on the site 3 years ago, I am gratified to find that there are now five; they vary greatly in size and shape, ranging from the chi-chi (with solar-powered aerator) to the bargain basement (old bath). CEO, Birds' Nest Lining Inc.
Not really blue, just a bit aimless, without much purpose, or focus, or energy to do anything more than make cups of peppermint tea and worry a bit about my disturbed digestion. The Lovely Son is here, and says that I have typical post-holiday dislike of my life, home, country; on the other hand, he also says that I tell him 20 times a day how lovely Harry is and how much I love him (Harry, that is; the gorgeous fat Harry) despite his nasty habit of pulling clumps of fur out and leaving them all over the house. I also love Kevin, so clearly Post-Holiday Dislike has its limitations, and doesn't include cats. But it's hard to feel enthusiastic about anything else. Flying upsets my insides; they hurt when I eat, and even dull, light, invalid-type food feels like I've swallowed a large boulder. And upset insides are not conducive to settling back happily into a productive lifestyle whereby one day I might join the ranks of those bright and bushy-tailed retired people who say they are busier than they have ever been before in their lives. I am doing very little indeed. Actually, I hate the idea of ever being busier than than I was when I worked; it wasn't nice then, and it wouldn't be nice again. And if it did happen, I would expect friends to forcibly drag me back to my senses and order daily lie-ins and afternoon naps, heaps of magazines and long phone calls, all great busy-ness avoiders. But the Lovely Son and I will do something productive tomorrow, weather permitting. We will use the pressure washer and clear the green nastiness off the back yard, and we might make it to the allotment to weep over the weeds. 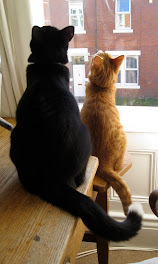 We will prime the allotment fence with clumps of cat fur for little birds to line their nests with, and we will think that we have done more than enough for one day. Oh, and on Tuesday the dog is going to get her hair cut. She looks amazingly scruffy and shapeless; time to reveal that trim little shape and those boot-button eyes again. I shall post before and after pictures for the amusement of her public.